A while ago I reviewed the e.p. ‘Slices from…’ by French rockers Yeallow. 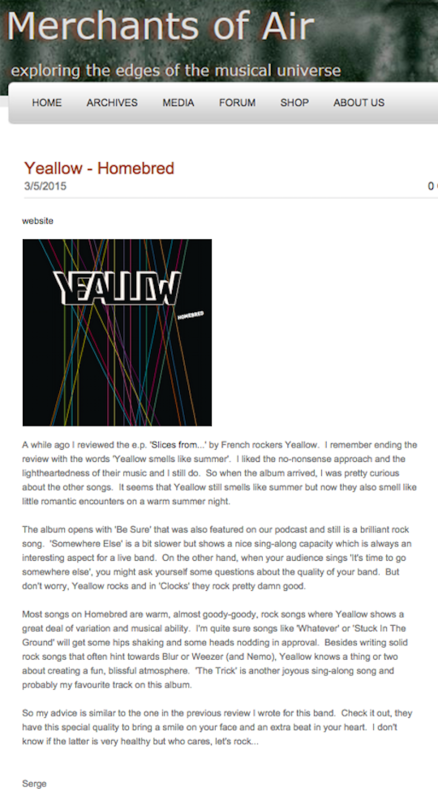 I remember ending the review with the words ‘Yeallow smells like summer’. I liked the no-nonsense approach and the lightheartedness of their music and I still do. So when the album arrived, I was pretty curious about the other songs. It seems that Yeallow still smells like summer but now they also smell like little romantic encounters on a warm summer night. The album opens with ‘Be Sure’ that was also featured on our podcast and still is a brilliant rock song. ‘Somewhere Else’ is a bit slower but shows a nice sing-along capacity which is always an interesting aspect for a live band. On the other hand, when your audience sings ‘It’s time to go somewhere else’, you might ask yourself some questions about the quality of your band. But don’t worry, Yeallow rocks and in ‘Clocks’ they rock pretty damn good. Most songs on Homebred are warm, almost goody-goody, rock songs where Yeallow shows a great deal of variation and musical ability. I’m quite sure songs like ‘Whatever’ or ‘Stuck In The Ground’ will get some hips shaking and some heads nodding in approval. Besides writing solid rock songs that often hint towards Blur or Weezer (and Nemo), Yeallow knows a thing or two about creating a fun, blissful atmosphere. ‘The Trick’ is another joyous sing-along song and probably my favourite track on this album.